Disclosure: Ultiworld was compensated for writing this product review. All opinions are the reviewers’ own and are not subject to approval from the sponsor. Please support the brands that make Ultiworld possible and shop at TOKAY Ultimate! Two reviewers are better than one, right? This spring, Katie and I got to spend some quality time with the latest cleat offering for ultimate players. We’re excited to tell you all about our experience wearing TOKAY ultimate’s cleats, which hit the market in December 2017. Katie: TOKAY is a new entrant into the niche world of ultimate-specific cleats. After a successful Kickstarter campaign in 2016, the company developed several prototypes that would go on to become their core product: the TOKAY cleat. The France-based company already has big names like the Cardenas twins, Rena Kawabata, and Michelle Phillips writing reviews for them, so the Ultiworld crew figured we’d give them a try. 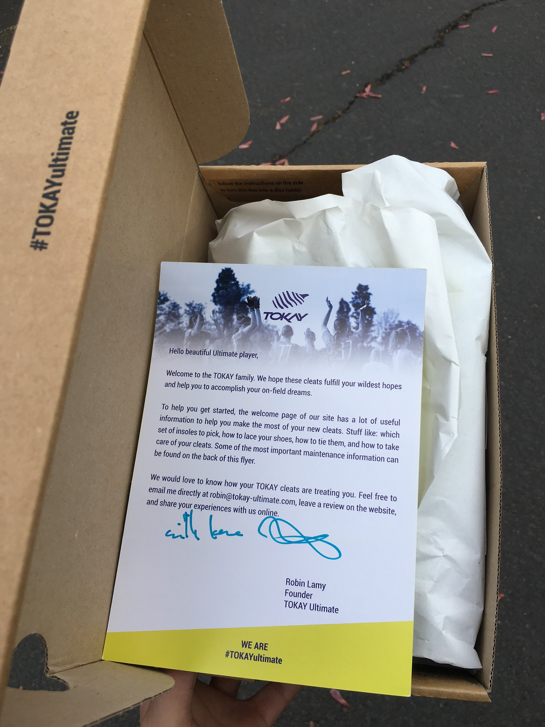 Simon: Before we dive into the experience of wearing these cleats, I want to point out something that really strikes me about TOKAY–from the conception of his design to the launch of his cleats, founder Robin Lamy has been totally transparent about the development process. We first interviewed him back in September of 2016. He’ll get as technical as you can bear (and beyond) about shoe construction. Lamy came to cleats with some fascinating experience in the footwear industry, something that’s reflected in his joyful discussion of all the different technical specifications. I think that nerdiness for shoe construction shows in the quality of the product. Pair that with his company’s love of ultimate, and it’s resulted in a product that actually has a for-ultimate-players-by-ultimate-players vibe. Katie: As a marketing and user experience nerd in my “real job,” I dig that the cleat came from more than 1,300 user surveys and from experienced designers1. 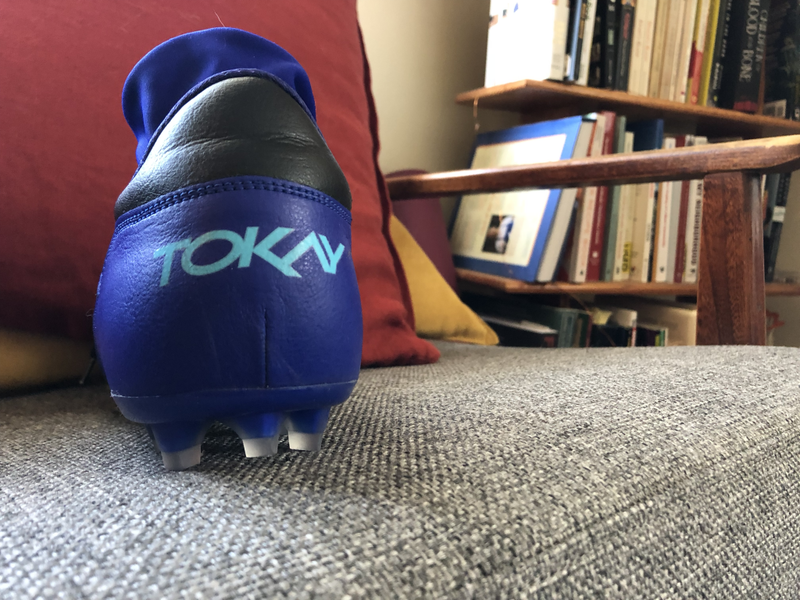 As an ultimate player (and a human), I also appreciate that TOKAY took steps to make their product environmentally friendly (no vinyl plastic in the shoes); they visited the factory making their shoes to ensure workers’ safety; and they’re actively sponsoring gender equity through partnerships with Upwind, the UAP, and the Asia-Oceania All-Star Tour. Simon: Focusing on the community is woven into Lamy’s vision. 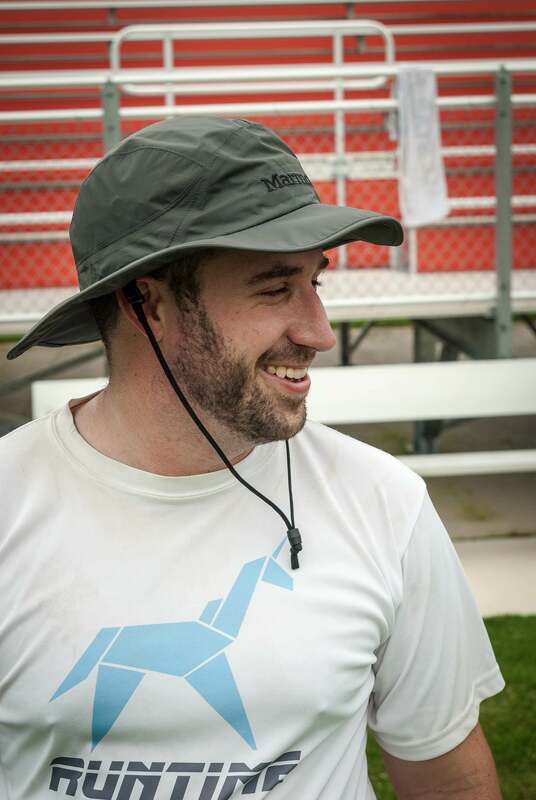 “I always like to mention a stake that we took from the beginning, to me ultimate is both a sport and a community, and what I think got me sticking to that sport is also the values of this community, which is based on trust,” he said. Katie: The highest praise I can give these cleats is that after trying them on once, I trusted them to support me through an arduous month of tryouts. They’re still the cleats I use today, and I’ve loaned the extra tryout pairs to teammates in need, with a hearty recommendation. They loved them, too. Simon: I didn’t exactly make Seattle Underground wearing my trial pair, but after years of wearing lacrosse cleats to protect my ankles and provide greater comfort than narrow soccer-style boots, my biggest compliment for the TOKAY experience so far is that the design was good enough to make me consider going back to a lighter, lower-cut cleat. Katie: TOKAY cleats come in two fit options: low-cut and mid-cut. I only tested the low-cut, which was a mistake on my part since I prefer more ankle support generally. The cleats also come in two colors: black and a light tan, each with their signature design on the side. Simon: All models have a slick, stretchy inner liner woven into the shoe itself. I found that this addition made putting the cleats on easy after I loosened up the lacing a good bit out of the box. I’ve got two decades of experience doing that weird new cleats dance where you stomp on your thumb and get red in the face from bending over while shoving your foot into a new shoe—happy to report that I avoided a return to the dancefloor with these. Katie: Overall, the cleat is sturdy with a solid plastic bottom and quality stitching. My pair has been through several months of hard use, and there have been no major signs of wear and tear. The glaring exception is the heel loop: both loops broke within the first few uses of the cleats, and the same thing happened to my teammate who borrowed my extra pair. Simon: Through throwing sessions and league-play, I saw few signs of wear and tear. After getting my size right (more in on this in a minute), the shoes seemed to loosen up normally. In my first game out, the TOKAY’S got hit with some light but steady Seattle rain and I stayed comfortable. No post-league swampfoot. In the long term, I worry a bit about that inner lining I liked so much out of the box. If I keep grabbing on that (and if I lose my heel loops, too) I’m worried that the stitching will start to loosen or undo itself. Simon: We ran into our first issues here. I was ready to chalk it up to conversion rates between United States and European shoe-sizing. Katie’s done the investigative legwork on this one. Katie: The sizing process is my biggest issue with TOKAY cleats, and the main reason that I dock them overall points. TOKAY has their own recommendations for finding your size, which I followed begrudgingly but diligently.2 I measured my foot on a piece of paper, compared the length to their sizing chart, and dubiously submitted a shoe size that seemed far too small based on my lifetime of ordering shoes. Sure enough, the first pair of cleats I tested were agonizingly small. I tried to measure again, but in ordering, I trusted my own sense of sizing for the re-order, and I got the perfect size. While the company’s attempt at creating a universal sizing method is appreciated considering their international audience, there’s room for improvement and simplification. Simon: My first pair were also about a size and a half too small. I unknowingly shoved my feet into them for the first half a league game and wound up with a heel blister. Once I had a truer fit (TOKAY sent us both a size and size and a half up), the experience improved dramatically. Lamy told us that reaching the international audience as a startup has been a challenge. TOKAY is growing—as of this review they’ve sold almost 1,000 pairs—so sizing and shipping challenges come with the territory. For our States-based audience, you might do best to stop by your local sports or shoe store and get your foot measured before ordering a pair of TOKAYs. Definitely double-check your size. And if you’re used to wearing a boxier, mid or high-cut lacrosse cleat with a lot more room in the toe box, check the sizing on a pair of shoes you’ve worn recently that have a slimmer fit. Katie: For our lazier States-based audience, I recommend ordering off their sizing chart based on your U.S. shoe size, and if it’s not the right fit, you can always return them and get a new fit. Simon: Again, once we got the sizing issues figured out, the Toaky fit was very good. I wore my pair as is (no aggressive tips for breaking in), just with the laces loosened up a lot since my feet run a bit wide. 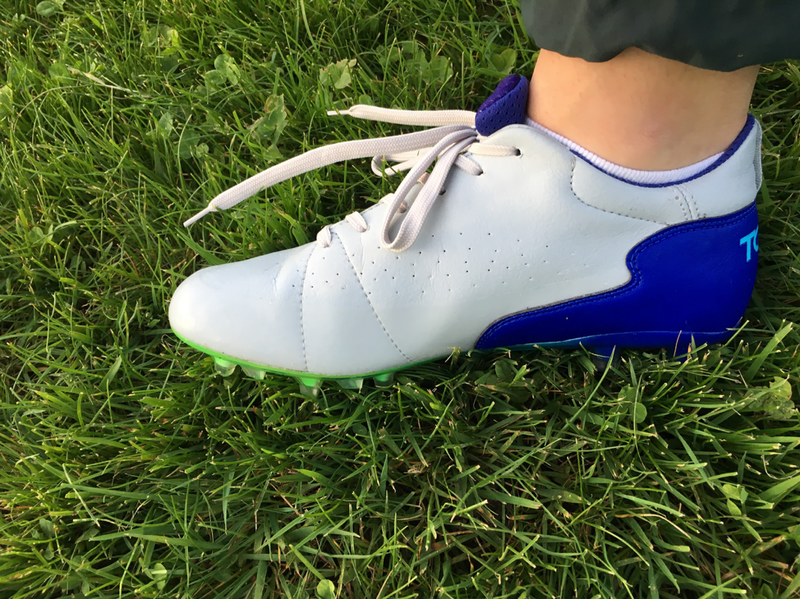 Since I’m used to a heavier cleat with more material, TOKAY shoes felt snug and light on my feet. This is the obvious benefit for a design that takes more cues from international soccer cleats. I found these differences most notable during lateral movements, like quick side sprints to go after a throw that was off target and with pivoting. Another interesting note on fit: with those wide feet I mentioned, I’m used to the feeling of my foot bulging out over the cleat plate and feeling a lack of support when I plant to cut. I haven’t felt that yet with TOKAY and that’s also come as a welcome surprise. 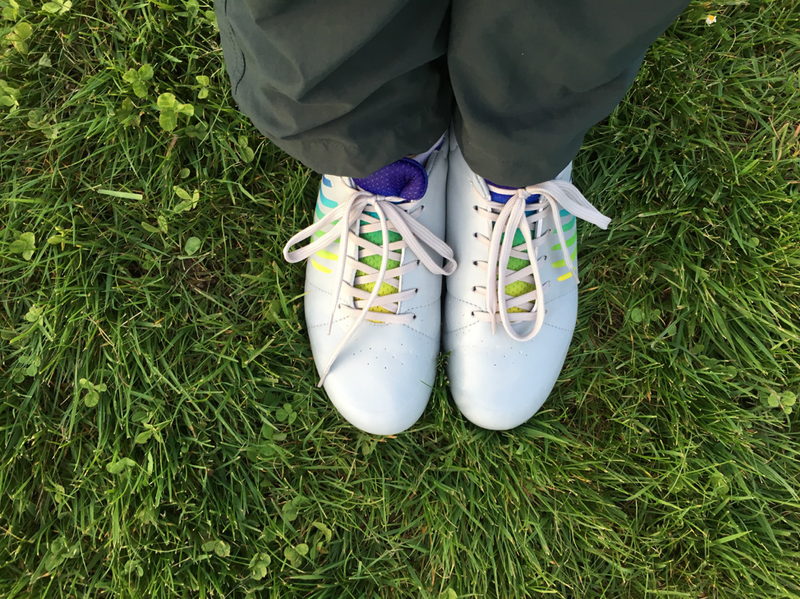 Katie: The cleats fit very comfortably, and each pair comes with optional insoles for added comfort, a touch I appreciate. I find that my heels rise out of the shoes a little as I run, but I haven’t minded it too much, and I’m still able to change direction easily. The only detractor for the fit—if this even qualifies—is that the laces are very long. I usually have to tuck them into the side of the shoes or into the lacing itself so that I don’t trip myself. Based on a few minutes of Internet research, this seems like a trend for European soccer cleats, so it may be less of a design flaw than just a cultural difference. Simon: Maybe it’s my grumpy old man-ness finally giving way to the return of flashier colors in sportswear, but I quite liked the color palate. TOKAY blends an attractive bluish-purple, greens, and yellows into their two base colors (black or white). Wearing the black cleats felt slick—a nice pace change from seeing bright whites quickly dirtied by a few footwork drills during warmups. Katie: It didn’t occur to me before these TOKAY cleats that you could get compliments on your cleats. But I’ve had more than five different interactions about how fly the cleats look since I’ve been wearing them—people love the blue to yellow gradient on the sides, and I do, too. The bottoms are yellow without being too flashy, which I appreciate. Want to look fresh while you cut? Invest in some TOKAY cleats. The cleats also come in a pretty nice package which includes a personally signed letter from Lamy — like, it’s actually signed. It was a nice touch. Katie: A pair of TOKAY cleats runs about 119 euro, which converts to about $140 US dollars. However with shipping factored in, the total comes closer to $165 for a pair of TOKAY cleats. That’s on the higher end of the price spectrum for cleats that don’t sport the Nike swoosh or a more well-known brand. Simon: The price tag makes TOKAYs a luxury cleat. I know that when I’m forking cash for an upgrade item, I often have a irrational fear of getting ripped off—am I really improving my experience that much by stepping up in price? I’m happy to report that, from the ease of the first fit with my true size to the work on the field, TOKAY’s cleats really did feel like an upgrade. You can find TOKAY cleats on their website. Comments on "Product Review: TOKAY Ultimate Cleats"